The tool delivered for testing was the new Big Brother 2 deep hollowing tool with a 16mm (5/8in) shaft and a 660mm (26in) handle. It was also supplied with a side handle and a 40mm (1 5/8in) toolpost along with a bar and double hollowing gate, or tool support. The twin tool gates sit either end of a substantial steel bar which is threaded to the top of the toolpost. 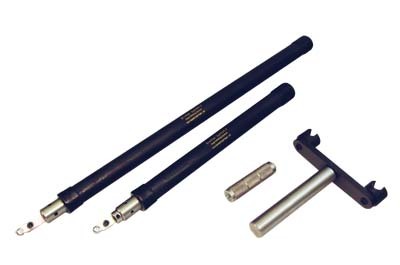 The twin gates are designed to support the two different tool shaft diameters. The new optional side handle is solid steel with a knurled grip, it is substantial enough to stabilise the large handle and to counteract any rotational torque from the cutter. 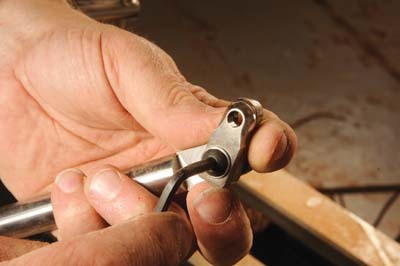 It threads directly into the collar at the front of the tool handle. Also available, but not tested are a Little Brother with a 12mm (1/2in) shaft, which uses the same cutter as its Big Brother version, a large curved stem to fit the Big Brother and a smaller swan stem to fit the Little Brother. 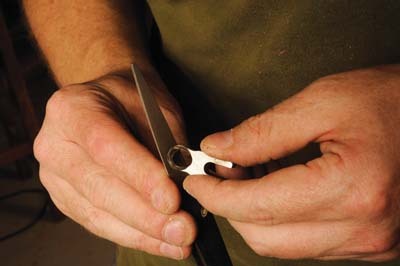 To further complement the tool there is a set of six Nikos Siragas scrapers which are available either as a set or as individual cutters. 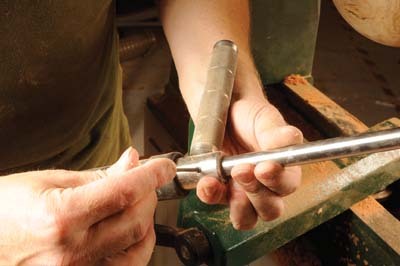 All the turning trials were completed using the tool gate; I find that in general these supports provide a solid fulcrum from which to control almost any hollowing tool. In my opinion, they enable the turner to concentrate on controlling the tool to a greater extent than the alternative of using a conventional toolrest. The only potential downfall is that it may be a little easy to inadvertently exert too much side pressure on the tool tip and burst the side wall of a thinly turned vessel. I tried out the tool in three different situations. The first trial was on a previously part turned yew (Taxus baccata) vessel. The vessel was turned into the end grain which was fairly dry and quite hard. The tool was working with an overhang of around 150mm (6in) initially and worked steadily down to in excess of 255mm (10in). There with no problems, the tool cut well and once the cutter shield was adjusted to reduce the cut, the shavings passed through without jamming. The second test piece was the inside of a side grain beech (Fagus sylvatica) bowl. 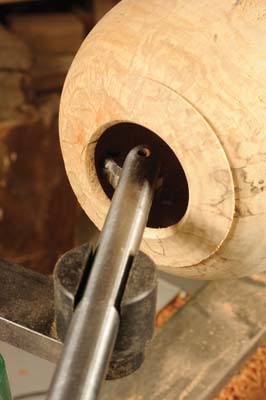 Part of the wood was spalted and soft, the tool struggled with the soft sections of wood and was prone to jamming up; in fairness this would have been the case with any hollowing tool whose design required the shavings to pass through a shielded cutter arrangement. Where the wood was sound the tool cut through both side and end grain cleanly. The final work was conducted on an end grain section of walnut (Juglans regia). The wood was still slightly wet and as this is representative of much of my normal work, for me, this gave the most accurate reflection of the tool in what, for me, would be a normal environment. The cutter made its own way into the timber without any prepared pilot hole; it cut cleanly in both the heart and sapwood. The cutter gap initially was relatively small and as it performed well, I felt confident to open it up somewhat. The subsequent cuts were pretty heavy, the cutter and tool performed well, and even with heavy cuts the tool gate supported and held the shaft with no significant vibration. Overall I could only make one suggestion for improving the set up; this doesn't relate to the tool but to the toolpost and support. The bar on which the twin gates are mounted is threaded onto the top of the toolpost. At times I found that this had a tendency to move slightly as the movement from pushing the tool forward unthreaded on the support bar. I think I would have to modify this with the addition of a simple locking pin, Loctite or similar, were this to be my own kit. I think the new cutter, which is now common to both the Big and Little Brother tools, seems slightly smaller than the previous version. It seemed to me that this reduction in size enables it to take a smaller, sweeter cut, making it less prone to jamming up with shavings and therefore more controllable as a result of this addition. In summary, the Big Brother hollowing tool is strong, easy to use, simple to set up, and robust enough for regular use. 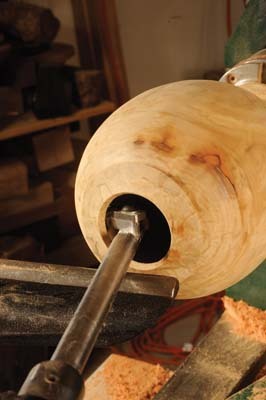 The addition of a curved shaft and some Siragas scrapers would make it a complete and versatile hollowing tool for many turners. The side handle is a significant improvement over the previous design. As I already own a set of Nikos Sirgas scrapers, I can say that these are heavy-duty quality scrapers that really work well with the deep hollowing tools. Keith is correct in saying that this is a robust and well made tool. I like the simplicity of the cutting tip - a shielded cutter adjustment mechanism - which has no bells and whistles, just one machine screw. It is a no-nonsense arrangement that can be adjusted to what you require by slackening off the machine screw. You just move the cutter head to the position you want and adjust the shield to create a coarse, aggressive, or a delicate cut as required. As with any new item, it takes a little getting used to adjusting it, but it does not take long and you will soon find out what suits you best. This simple mechanism is also easy to unclog. The shaft fits into the handle, which can be set at various depths to suit your project; the handle shoulder acts as a depth stop and you have more control over what is happening as a result. As with many tools with replaceable cutter heads, honing will create an edge quickly and easily without removing too much steel. Use a grinder at your peril; they are too quick and aggressive and you are likely to ruin the cutter heads on tools such as this.